1. Roofing System* — Any UL Class A, B or C Roofing System (TGFU) or Prepared Roof Covering (TFWZ) acceptable for use over nom 15/32 in. thick wood structural panels, min. grade "C-D" or "Sheathing". Nom 15/32 in. thick wood structural panels secured to trusses with No. 6d ringed shank nails. Nails spaced 12 in. OC along each truss. Staples having equal or greater withdrawal and lateral resistance strength may be substituted for the 6d nails. Construction adhesive is optional and may be used with either nails or staples. 2. Trusses — Pitch or Parallel chord trusses, spaced a max of 24 in. OC, fabricated from nom 2 by 4 lumber, with lumber oriented vertically or horizontally. Truss members secured together min. 0.0356 in. thick galv steel plates. Plates have 5/16 in. long teeth projecting perpendicular to the plane of the plate. The teeth are in pairs facing each other (made by the same punch), forming a split tooth type plate. Each tooth has a chisel point on its outside edge. These points are diagonally opposite each other for each pair. The top half of each tooth has a twist for stiffness. The pairs are repeated on approximately 7/8 in. centers with four rows of teeth per inch of plate width. Where the truss intersects with the interior face of the exterior walls, the min truss depth shall be 3 in. and a min. area in the plane of the truss of 21 sq/ft. Where the truss intersects with the interior face of the exterior walls, batts and blankets shall be firmly packed against the intersection of the bottom chords and the plywood sheathing. Min roof slope of 3/12 unless American Gypsum boards are used, in which case there is no minimum slope. 3. Gypsum Board* — Three layers of 5/8 in. thick by 4 ft wide gypsum board. Top layer boards installed with the long dimension perpendicular to trusses with end joints located under bottom of trusses. End joints in adjacent rows shall be staggered on adjacent trusses. Top layer boards secured to bottom chord of trusses with 1-5/8 in. long Type S bugle head screws, spaced max 8 in. OC. Screws located 1-1/2 to 2 in., and 3/4 in. from side and end joints, respectively. Bottom two layers of gypsum board installed perpendicular to furring channels with end joints centered on the furring channels. Middle layer boards secured to each furring channel with 1 or 1-1/4 in. long Type S-12 bugle head steel screws spaced max 8 in. OC. Screws located 1-1/2 to 2 in. and 5/8 to 3/4 in. from side and end joints, respectively. Face layer boards secured to each furring channel through the middle layer with 1-5/8 or 1-7/8 in. long Type S-12 bugle head steel screws, spaced a max of 8 in. OC. Screws located 1-1/2 to 2 in. and 5/8 to 3/4 in. from side and end joints, respectively. End joints and side joints of the face layer boards shall be staggered a min of 16 in. from the joints in the middle layer. If end joints of the face layer boards are not centered on the furring channels, the end of boards at the end joint shall be attached to the middle layer boards with 1-1/2 in. long Type G steel screws spaced 8 in. OC and located 1-1/2 in. from the end joint. All screws shall be driven no further than flush with the face of the boards in order not to damage the core of the boards. 4. Furring Channels — Resilient channels, 1/2 in. deep, or inverted hat type furring channels, 7/8 in. deep, formed from 0.019 in. thick galv steel, spaced 16 in. OC perpendicular to trusses. Channels secured to each truss with 1-7/8 in. long Type S steel screws. When insulation (Items 5 or 5A) is draped over or loose laid over the furring channel/gypsum board ceiling membrane, the furring channel spacing shall be reduced to 12 in. OC. a. Furring Channels — Formed of No. 25 MSG galv steel, 2-9/16 in. or 2-23/32 in. wide by 7/8 in. deep, spaced 24 in. OC perpendicular to trusses. When insulation (Items 5 or 5A) is draped over or loose laid over the furring channel/gypsum board ceiling membrane, the furring channel spacing shall be reduced to 12 in. OC. 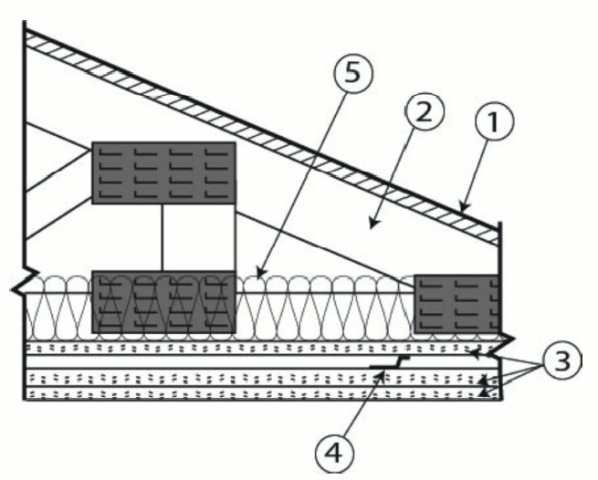 Channels secured to trusses as described in Item b. Ends of adjoining channels overlapped 6 in. and tied together with double strand of No. 18 SWG galv steel wire near each end of overlap. b. Steel Framing Members* — Used to attach furring channels (Item a) to trusses (Item 2). Clips spaced 48 in. OC. RSIC-1 and RSIC-1 (2.75) clips secured to alternating trusses with No. 8 x 2-1/2 in. coarse drywall screw through the center grommet. RSIC-V and RSIC-V (2.75) clips secured to alternating trusses with No. 8 x 1-1/2 in. coarse drywall screw through the center hole. Furring channels are friction fitted into clips. RSIC-1 and RSIC-V clips for use with 2-9/16 in. wide furring channels. RSIC-1 (2.75) and RSIC-V (2.75) clips for use with 2-23/32 in. wide furring channels. Adjoining channels are overlapped as described in Item a. As an alternate, ends of adjoining channels may be overlapped 6 in. and secured together with two self-tapping No. 6 framing screws, min 7/16 in. long at the midpoint of the overlap, with one screw on each flange of the channel. a. Furring Channels — Formed of No. 25 MSG galv steel. 2-3/8 in. wide by 7/8 in. deep, spaced 24 in. OC, perpendicular to joists. When insulation (Items 5 or 5A) is draped over or loose laid over the furring channel/gypsum board ceiling membrane, the furring channel spacing shall be reduced to 12 in. OC. Channels secured to joists as described in Item b. Ends of adjoining channels overlapped 6 in. and tied together with double strand of No. 18 SWG galv steel wire near each end of overlap. b. Steel Framing Members* — Used to attach furring channels (Item a) to the trusses (Item 2). When trusses are spaced 16 or 24 in. OC, clips spaced a max of 48 in. OC. Genie Clips secured to alternating joists with No. 8 x 2-1/2 in. coarse drywall screw through the center hole. Furring channels are friction fitted into clips. a. Furring Channels — Formed of No. 25 MSG galv steel, 2-5/8 in. wide by 7/8 in deep, spaced 24 in OC, perpendicular to trusses. When insulation (Items 5 or 5A) is applied over the resilient channel/gypsum panel ceiling membrane, the resilient channel spacing shall be reduced to 12 in. OC. Channels secured to joists as described in Item b.
b. Steel Framing Members* — Used to attach furring channels (Item a) to the wood trusses (Item 2). Clips spaced at 48" OC and secured to the bottom of the trusses with one 2 in. Coarse Drywall Screw 1 in. diam washer through the center hole. Furring channels are then friction fitted into clips. Ends of channels are overlapped 6" and tied together with double strand of No. 18 AWG galvanized steel wire. 5. Batts and Blankets* — Any glass fiber insulation bearing the UL Classification Marking as to Surface Burning Characteristics and/or Fire Resistance. Insulation secured against the roof, held suspended in the concealed space or draped over the resilient channels (or furring channels) and gypsum panel membrane. Minimum density of 0.5 pcf with no limit on overall thickness. 5A. Loose Fill Material* — As an alternate to Item 5, Any loose fill material bearing the UL Classification Marking for Surface Burning Characteristics, having a min density of 0.5 pcf and installed with no limit on overall thickness.